There has never been a more anticipated season opener in UB history. But there’s also never been an offseason like this. That’s what makes this game, and this season, so exciting. Yes, there were Bulls fans who had high hopes before the 2008 and 2013 seasons. Those seasons were exciting and satisfying. But I have never sensed more interest in a Bulls season than I do now. The reasons are clear. Last season, and the three game winning streak to end it, raised the bar for what the Bulls can do. Returning so many key players and big names increased the confidence level of the coaches, players and fans. The offseason honors exposed the UB stars to a wide audience. The NFL buzz for Anthony Johnson and Tyree Jackson now has the large community of NFL Draftniks watching Buffalo. The preseason predictions of national outlets confirmed what many already knew. So enjoy this, Bulls fans. Enjoy the good feelings you have right now. There should be plenty more over the next three months. Bull Session Trivia: Delaware State’s most famous football alum is a NFL wide receiver and Super Bowl hero. This former Hornet caught the game winning touchdown in Super Bowl XXIII, and was the very good #2 receiver to a Hall of Famer. Who is this DSU alum? The Bulls return eight starters on offense, and nearly every key player who touched the ball. It starts with QB Tyree Jackson, and the way he ended last season. After coming back from his knee injury, T3 averaged 341 yards passing and threw 12 TD passes in the last three games. He has elevated his game to a complete quarterback, who can stand in the pocket and scan the field. Don’t expect to see him run too much, and not as much as he did early in 2017. He’s too valuable, and too good a passer to not use that skill the most. Tyree’s added even more maturity, leadership and smarts to his game. I’m excited to see how much more he’s developed as a passer. Jackson should be the best QB on the field almost every week…What’s next for Anthony Johnson after one of the best seasons we’ve ever seen by a receiver? It will be interesting to see how the Bulls offense adapts to every team’s coverage focused on #83. That is where every defensive coordinator will start. Lance Leipold says the coaching staff has worked hard to devise ways to beat double coverage, and adapt to different defensive approaches…It helps when there are plenty of other weapons for Jackson to use. K.J. Osborn is a very good #2. Antonio Nunn, with 3 of his 15 catches last year going for more than 40 yards, moves into the starting lineup. Wisconsin transfer George Rushing brings a veteran savvy. Three redshirt freshmen-Rodney Scott, Charlie Jones, Isaiah King-make this the deepest receiver corp in years…Don’t forget the tight ends, Tyler Mabry & Zac Lefebvre. With so much attention focused on the receiver, they could make big plays in the middle of the field…The offensive line returns three starters: James O’Hagan (C), Evan Ksiezarczyk (LT), Tomas Jack-Kurdyla (RG). New starters Paul Nosworthy (LG) & Kayode Awosika (RT) both played a lot as backups in 2017…They will be blocking for a good group of running backs. Emmanuel Reed is back as the starter after an 840 yard, 9 TD season. Johnathan Hawkins is healthy and will be the backup. Watch out for redshirt freshman Kevin Marks, a James Starks run-alike, who is the Bulls fastest back and a big play threat…Delaware State gave up 38 points per game on defense in 2017. That includes 59 points to West Virginia and 77 to Florida State. They allowed 17 plays of 40 yards or more…The Hornets are strong in the secondary. CB Keyjuan Selby & FS Jahad Neibauer are the leaders. LB Brian Cavicante is a preseason all-conference player…A scheme change, and injuries, mean the Hornets have freshman listed as starters at two of the four LB positions. Bullet Points: UB’s offense returns 99% of their rushing yards from 2017, 74% of their receiving yards and 73% of their receptions. There were more losses on defense, with only six starters back. But that group includes the leading tackler, best pass rusher and both cornerbacks. That core group of players will lead the defensive effort…Up front, Chuck Harris emerged as the one of the MAC’s most explosive, big play defensive ends. In the last three games of 2017, he had 25 tackles, 2 sacks, 4 TFL’s, 2 forced fumbles and a touchdown. Malcolm Koonce and Myles Nicholas will replace Demone Harris at the other end spot…Justin Brandon, a true space-eater, is back at DT. The other spot will be manned by a rotation of up to six players, with Chibueze Onwuka as the starter…Khalil Hodge has 277 tackles over the last two seasons, more than any other NCAA FBS player. With three sacks and two interceptions last season, he expanded beyond tackles. That’s his goal for 2018, more game-changing plays…Jordan Collier is back at outside linebacker. The third LB will be freshman James Patterson, a 235-pound hitter who had 180 tackles in high school. He outright won the job in the offseason…With four senior cornerbacks returning, but no safeties back, the Bulls moved Brandon Williams to free safety. He’s a veteran with good enough speed to handle the job. This week, he’ll be the one wearing #41 in honor of Solomon Jackson…Sophomore Tyrone Hill won the other safety spot, after JC transfer Joey Banks battled injuries…Having veteran corners Cam Lewis and Tatum Slack makes life easy for defensive coordinator Brian Borland. Both can play zone and man-to-man, and are aggressive in pass coverage. 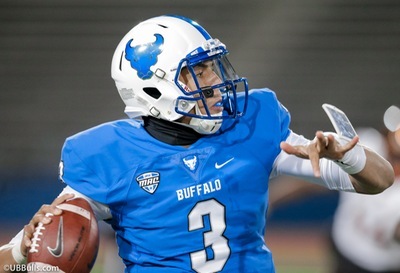 This is a big strength for the Bulls, and it will allow UB to blitz more and rely on single coverage…No idea who Delaware State will start at quarterback. Jack McDaniels is a passer, Keenan Black is a runner. Both played last year, with Black leading the Hornets to their only two wins…DSU has two good, athletic running backs. Brycen Alleyne and Mike Waters have both started and been successful…Receiver Trey Gross is six-foot-four, and caught seven TD passes in his last 6 games. Taronn Selby led the team in catches last season. There are two significant rule changes that could come into play in this game. First, a new rule allows the kickoff return team to fair catch any kick that lands inside the 25-yard line. The offense will then start from the 25. If a team’s kicker can’t get it into the end zone, this could be a strategy for better field position. Look for more teams to squib kick to avoid that. Another new rule this year allows any player to appear in up to four games, but still maintain his redshirt. So if the Bulls coaches wanted to play a few freshmen late in this game, that won’t affect their ability to still have four more years to play. The change is designed to provide roster flexibility, and keep the young players engaged. It may prompt coaches to experiment with talented freshman to see if they can help a team during the season. Bull Session Trivia Answer: John Taylor played for the San Francisco 49ers from 1987-1995. He caught the winning touchdown pass from Joe Montana to beat the Bengals in Super Bowl XXIII. Taylor caught 347 passes, teaming up with Jerry Rice to form the Niners lethal passing attack under Coach Bill Walsh.